Using essential oils for babies is a beautiful, wonderful thing. With the right guidance, you can easily help support your little one from head to toe with just a simple touch of nature. While using essential oils on little ones can be intimidating for some, it's honestly a very easy and glorious task. Essential oils can support your baby and help them sleep better, feel better and even cry less. Why yes, that sounds beautiful right? When using oils for babies, you want to use only true, 100% pure oils. Unfortunately many labels out there are misleading and claim to be 100% pure when in fact they are not. In fact, they only have to be 5% pure to receive that fancy label. This means that other brands often contain synthetic ingredients or they are heavily watered down. Some companies even add man made smells to make their oils smell better - so crazy! I only trust Young Living oils for my little ones because I know that by using just a drop or two, I am giving them all that they need because it is so pure and effective. I know that no toxins or chemicals are going into their bloodstream. It's a beautiful thing when you can support your family naturally. In our home, we strive hard to kick the toxins out and use only plant based products and essential oils. We aren't perfect, but we are pretty mindful and everything that touches our skin is pure. It's a passion I have as a mother, and if it's not yours, that's totally okay. We all get there in different ways eventually or perhaps just a few small changes is all that you are looking for. Always dilute. There are some people who don't dilute, but I like to recommend to my readers to dilute for their little ones. You can easily search Pinterest for dilution ratios but honestly, we always do about two drops of oil to one, heaping tablespoon of coconut oil. Or we use one drop with a few pumps of the Young Living V6 carrier oil. Normally the ratio for babies is 1:30. Read Gentle Babies. Gentle Babies is a great book for pregnancy, mothers and babies. You can find this on amazon and it will breakdown a lot of the safety of oils for little ones. Invest in the Kidscents oils. These oils are already diluted, so just add a roller top to them and they are safe for your little ones. Do not apply citrus or photosensitive oils to areas that will be in direct sunlight. Normally your little one won't be in the direct sunlight anyway and typically citrus oils are rarely applied, so this is just something to file away and remember if needed. So what can you use your oils for? Which oils are great for what? Essential oils can be either diffused to be inhaled or applied topically. Young Living oils are so pure you can even ingest some of them, but we're not recommending that for the little ones. 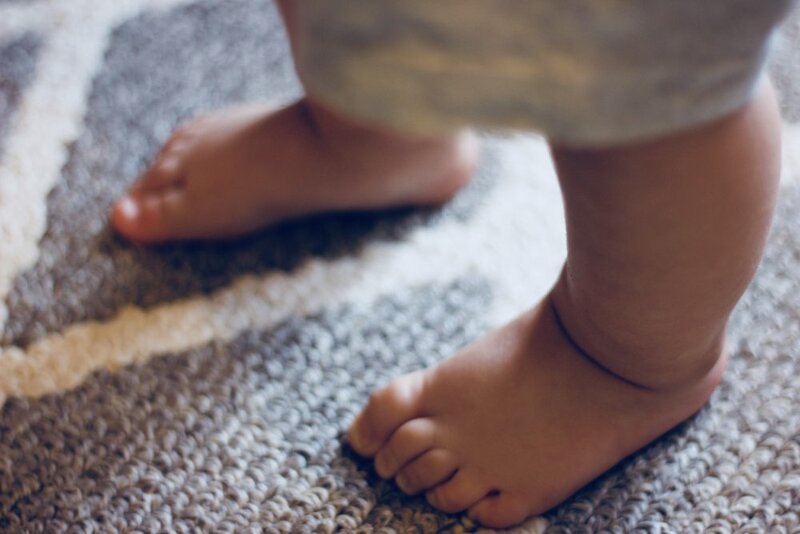 Just a simple diffuser in their nursery or a rub on the feet is typically all it takes. Most frequently you'll want to apply them to the bottoms of the feet for things like immune support, sleep and bellyaches. You can also massage the belly in a circular motion and for skin and calming support, a baby massage (or diffusing) is the perfect choice. For respiratory support, you can make a chest rub or diffuse for baby. We apply Copaiba Vitality oil straight to the gums for teething and it helps nix the fussiness. Young Living has many oils and essential oils blends that can be safely used for emotions. Since little ones aren't dealing with a ton emotions though, most of the time you can just get by with using Lavender + Frankincense (available in the starter kit) and maybe Gentle Baby (a favorite of mine!). Again, the possibilities are endless for oils for sleep. There are so many recipes and blends that you can use to help your little ones sleep. In fact, this is often the biggest testimony I receive from people is that oils helped their little ones to sleep better. Most people again just use Lavender and Frankincense from the starter kit and see success with this (we do!). Others often love Gentle Baby, White Angelica, Orange, Peace and Calming or Dream Catcher. The beauty of Young Living is that their products for little ones goes well beyond just essential oils. 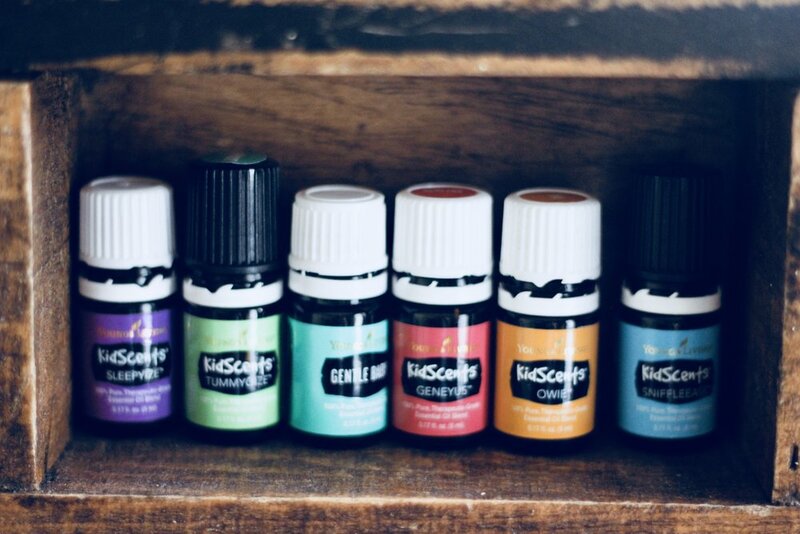 While you can easily make your own DIY products with essential oils, sometimes you just like the ease of ordering the essentials and being done. 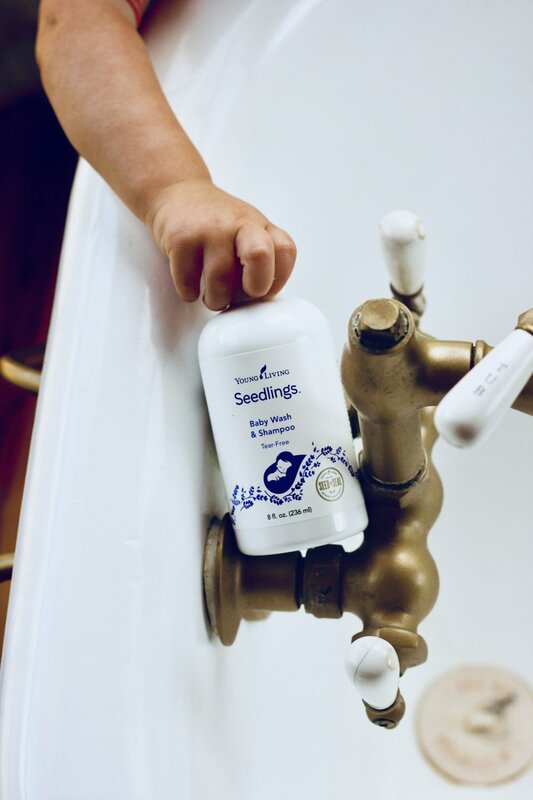 Young Living has a new baby line, Seedlings, that is so wonderful. Pure and natural products with a scent of essential oils that smells so incredibly dreamy. Their products include wash, diaper cream, linen spray, lotion, baby oil and baby wipes. I love the security and confidence I can have with using safe products and truly pure oils on my baby and even my older children. And this is just the start. Essential oils can support you and your emotions SO much (hello and goodbye postpartum ickiness). If you think that this is something for you and you still have more questions or it seems overwhelming, it's my job to take care of that and help guide you on this journey. Email me at themushymommy@gmail.com or chat with me on my Facebook page. Lastly, if you're ready to go in to this natural journey with no fees, no monthly obligations and no crazy rules or obligations, then check out this link here to learn more. I would love to hold your hand down this journey to wellness, health and hopefully more sleep! Save the graphic below for guidance.